Topological Data Analysis (TDA) and Ayasdi Iris continue to capture the attention of the public. One of our most recent recognized was for our innovative technology. Winning The San Francisco Business Times Tech & Innovation Award is a huge accomplishment and a true validation of the work we are doing around applying the mathematical study of topology to real world data problems, and we couldn’t be more appreciative and humbled. 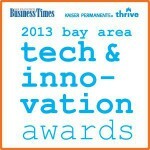 Congratulations to all of the other SF Business Times Tech & Innovation Award winners! Ask.com, Bill.com, BrightRoll, Delphix, Demandbase, Dropbox, Dropcam, Eventbrite, Fingerprint, Glassdoor, Glooko, Lithium Technologies, Marin Software, Message Bus, New Relic, Nextdoor, Path, Pearl.com, Practice Fusion, SideCar, Splunk, SquareTrade, Uber, Waze.